Do you know Fern? She is a Leadbeater’s Possum and the official mascot of Geocaching Melbourne. You can buy all kinds if merchandise or collectables with her face on it for the upcoming mega event. However there’s one thing you can’t buy: The golden unobtainium geocoin which is strictly limited to 25 pieces. But you can win one! Right here! Create a Fern-themed container and place the cache. The cache has to be in Victoria (including all stages). It has to be listed / published on a public listing service (It can be a premium cache though). Somebody found it after you placed it and logged it online. Take a picture of the container in place and a second picture of the general location. fern@geocaching.melbourne (We will confirm your entry – please contact us if you don’t get a response). You can enter as many caches as you like but remember it is about quality and not quantity. You can enter all cache-types (Traditional, Multi, Wherigo, …). Choose whatever works best for you. Creativity – if it’s self-made you definitely get a bonus for it. 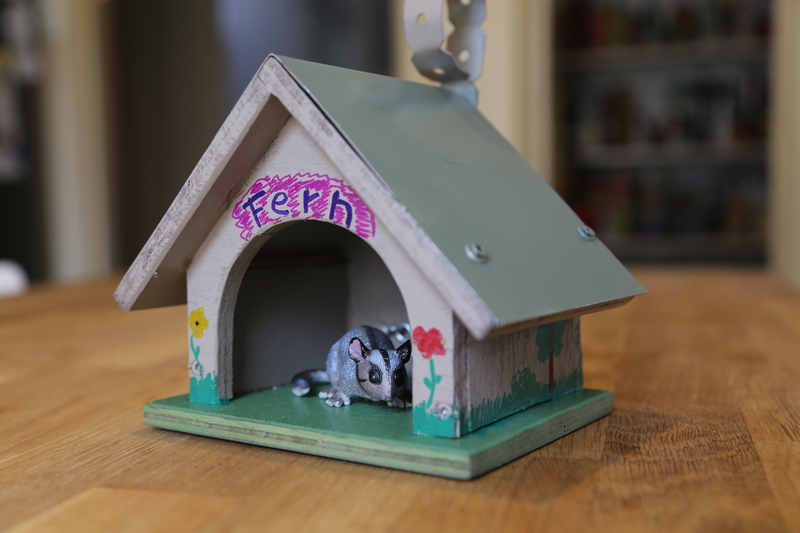 Container Size – Fern is a bit of a space-pig. A real life nest box would qualify as a large container so why not make the little fairy feel at home. Location – a new place with some unique feature, incredible scenery, or just a plain gorgeous view will bump up your marks. Cache Page – dust off these old HTML skills and make something nice and shiny. Sustainability – make your cache to last. Make sure you cover all five points and your cache will be a winner in any case because even if you don’t win this competition, you will win heaps of well written logs. It would be sad if we hand out only one prize because we expect some serious competitors. The winner’s will be announced by the 8th November and can collect their prizes at The Melbourne Event 2015 or get them posted. Get the circular saw, grinder and paint bucket going!